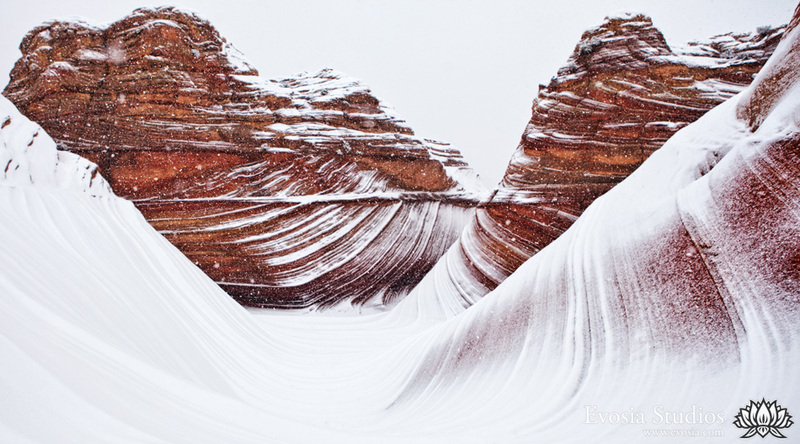 Winter arrived late here at the Wave in the Coyote Buttes North. I’ve seen many amazing photos of this place when mother nature is nice. But I wanted to see it at a time when mother nature gets a bit cranky. Timing could’t have been better as the snow started to fall just as I started my hike. In fact, it snowed a lot faster than I expected, with 2-3 inches on the ground by the time I finished the 1.5 hour hike. Make no mistake, this is the wilderness and you have to be prepared when heading out to a place like this even during sunny days. The slick rock can get slippery even without snow. With snow, it gets a lot worse. On good days, people get lost all the time. With a blanket of snow, landmarks and footprints become hidden, you have to bring a gps, map and/or compass. You also have to bring good winter clothes, a waterproof jacket and pants, hiking boots, food and water for an extended outing, and more. That day, I saw people with sneakers and jeans, folks without gps or compass, and people without food/water and weatherproof clothing. Luckily everyone made it out. But a handful of people got lost on the way out. One person fell and dislocated their shoulder. Please take Mother nature seriously as she can be very unforgiving. Please be careful out there and always go prepared for worst case scenarios. Posted on Wednesday, January 25th, 2012 at 9:38 pm. Filed under: Feature, Photography, Portfolio	RSS 2.0 feed.